Chairs have a long cultural, political, religious and symbolic history and are much in evidence in art. Fighting Chairs, situated at the stern of sports fishing boats, are used by fishermen to catch large highly prized game fish such as marlin and blue fin tuna. Fighting Chairs, when first seen by me, seem to immediately speak to other purposes, dental chairs, torture chairs, electric chairs, medical examining chairs. 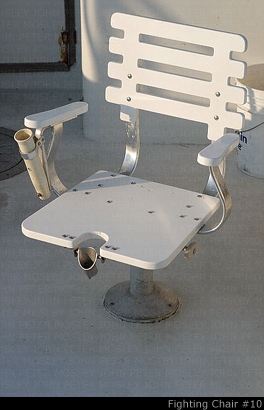 A boat captain told me that his wife thought that some Fighting Chairs looked like birthing chairs. My hope is that the viewer will make the imaginative leap to Fighting Chairs possible other purposes, perhaps initiating memories, discussions of uses of power and control or even cultural rituals, inclusive :groups of men going out into the void to re-enact ancient hunting and bonding techniques and exclusive: who does not go. I have used the beauty of soft, early morning light as a device to draw the viewer in and, hopefully, reflect. I have brought the imagined chairs out of the dark dungeons or interior rooms and theatres into the Waking Light. Each Chair is an individual, each image, a portrait. . The Fighting chairs are formally centered in calm environments. The viewer has no way of knowing whether or not the individual, the chair, will remain benign or suddenly become aggressive.